CM Magazine:Totem: Return and Renewal. Gil Cardinal (Writer & Director). William Belcourt (Associate Producer). Bonnie Thompson (Producer). Derek mazur (Executive Producer). 23 min., 3 sec., DVD, $99.95. Order Number: 153C 9107 136. What is the iconic image that comes to mind when you hear the name of a West Coast Native tribe such as the Haisla? In all likelihood, a totem pole. Totem poles fulfilled various functions. Sometimes, they served much the same purpose as a heraldic shield, being erected in the place where a family group lived. Other times, they served as part of the architectural detail of a dwelling place. Finally, they served as grave markers, as mortuary poles. Regardless of their function, many of these poles carved during the latter part of the 19th century found their way into settings such as Vancouver's Stanley Park or into various museums. Totem is the story of the return of a mortuary pole, carved by the Haisla of British Columbia, and which was housed in a Swedish ethnological museum for 77 years. The opening sequences of this DVD show the towering pole, encased by a metal band and guy wires which secure it to a display space in the museum. But, as the camera draws closer, we see that museum staff are working to remove the totem pole and place it in a special, climate-controlled shipping crate for its transfer back to the ancestral territory of the Haisla. This is an historic occasion, for it marks the first time that a totem pole from North America has been repatriated by the First Nation whose ancestors carved it. The pole makes its way from the Museum of Ethnography in Stockholm, through the Panama Canal to an official ceremony of transfer in Vancouver, where the pole is transferred to Chief G'psgolox, representing the Haisla Nation. Much international negotiation has made this long-awaited event a reality, and the emotions surrounding the event are powerful. Viewers see Haisla elders overwhelmed with tears; in the words of one elderly Haisla, the ancestors have come home. Then, the pole travels to Kitamaat village in northwestern British Columbia where song, prayer, and community celebration greet the totem. The shackles – the iron band which held the totem in place at the museum – have been removed and are held aloft in triumph. 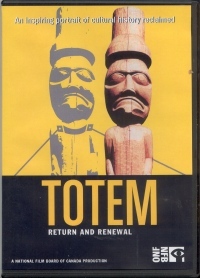 Totem is a comparatively short production (only 23 minutes), but it foregrounds the importance of the return of objects sacred to First Nations people, objects which were collected during the 19th and 20th centuries and placed in museums. For those outside the culture of West Coast First Nations, totem poles are beautiful ethnic artifacts; however, as we watch the joy experienced with the return of the totem, we come to understand the powerful emotional ties the totem poles have inspired in the First Nations people of British Columbia. Recommended as an acquisition for Native Studies programs, and a useful supplementary item for senior high school Canadian History programs.